Before Local 5362 there was CUPE Local 1550. CUPE Local 1550 included the Health Sciences Centre (HSC), CancerCare Manitoba (CCMB) and Diagnostic Services of Manitoba (DSM). In 2015 DSM bargaining unit left to join with Local 4214 that united all DSM CUPE members. In the spring of 2017, the Conservative government of Manitoba announced bill C29, the Health Care Bargaining Unit Restructuring Act. This act will set out to lower the amount of health care bargaining units from close to 200 down to 50 by making 4 rural health authorities (Eastern, Southern, Northern and Western) as well uniting all of the bargaining units within the Winnipeg Regional Health Authority and 2 “province wide” employers – CCMB and DSM. Within each of these 7 employer groups there would be 7 bargaining units. Due to the coming restructuring of the WRHA, CUPE proposed to merge all 21 of their WHRA Locals into one large local. This is how Local 204 originated. HSC was one of those 21 units, so they separated from Local 1550 to join with 204. CCMB remained Local 1550, but due to the huge change in the local structure and Local 1550 being associated with HSC and not CCMB, the members requested a local number change from National. This was granted and our charter for Local 5362 was received in November 2017. Below is the Local 1550 website front page prior to the change. Note: Local 204 will be in the process of instituting their own communications systems shortly. Until then, CUPE Local 1550 will continue to send out information to the HSC unit, using the 1550 email addresses, email system and website on behalf of Local 1550. Please watch for updates coming soon. ATTENTION Local 204 – HSC Members. Please see the notice below regarding CUPE/Employer information sessions. This was emailed out to the HSC members who have submitted their email addresses. If you did not receive this through email as of 21 October 2017, please check your spam box or re-submit your email address. ATTENTION HSC CUPE MEMBERS! Did you work any OT over a break? Please read below. Please see the update below regarding the ongoing employment changes at HSC. CUPE Local 1550 is organizing a rally to show support for the HSC workers who will be losing their jobs and for those who will be facing losing their full-time EFTs and being reduced to part-time. We will also be showing our solidarity to ALL Health Care workers in Manitoba who have or will be facing job loss or EFT decreases due to all of the cuts. We will have pamphlets ready to hand out to the passing foot traffic explaining what some of the cuts are, including working short, hiring freezes and of course position deletions. This Rally will be held in front of the Women’s Hospital from 11:00 – 1:30 on Thursday, September 21st. CUPE’s news release on September 12th told us that at HSC there are going to be approximately 111 jobs lost as well almost that many full-time jobs will be reduced to part-time jobs. At the time of that release not all information had been received by CUPE to make a final analysis. We are still receiving information in little bits at a time. We also know that many Unit Clerks and Unit Assistants will be losing their positions as the hospitals move to replace them with the dual trained Nursing Assistants! There will be cuts and changes to EFTs at all of the other hospitals in Winnipeg. CancerCare Manitoba has not seen these kinds of position deletions due to the government’s mandate. That does not mean that there won’t see any cuts or deletions in the future. There has been a clamp down on hiring and filling positions.Part-time and casual staff are being used like full-time, to the point that people are unable to plan their vacations or usage of banked OT or stat time because there are not enough part-timers or casuals with available hours to cover these requests. We have until November 15th to complete vacation scheduling but a number of staff are having difficulties getting these requests approved because there is not enough staff to allow for coverage. When staff are on vacation or are sick many of people are having to double up their workloads and do extra duties so that their own work falls behind. Come join us as we show our solidarity to all health care workers and protest these cuts that affect us all as we make the public aware of all that is happening and how these cuts will also affect them. The results of this election will not be known on September 20th as the ballots from all 21 of the Local 204 facilities will be counted at the same time at a different time and location. Please see the attached posters for the Local 204 Elections! Included is the election information and we also have the campaign materials from the candidates running for President: Debbie Boissonneault (Grace Hosp, Local 1599) and John Boyd (Seven Oaks Hosp, Local 2509). The Position of Unit Lead Shop Steward is up for election. Liam McCann and Belinda Raposo are running for this position. At this time, neither candidate has submitted any election materials. The ballots of this election will be counted as soon as all HSC Local 204 members in the room at 4:30 pm have had the opportunity to vote. CUPE News Release regarding HSC Cuts for Support Workers and Local 204 Elections! Please visit the CUPE Provincial Health Care Council website phcc.cupe.ca to get all of your elections information. There will be elections for Table Officers and Trustees on September 20th as well, some units will be having elections for Unit VP and Lead Stewards. Please watch for further information regarding the cuts. CUPE will have info tables set up in HSC in the MS Mall on Wednesday, September 13th and on Monday, September 18th. If you have any questions or concerns, please feel free to stop in at any time between the hours of 9 – 4. Please watch for notices of an upcoming rally! We’ve had a rally earlier in the summer but now that we know how the CUPE Members at HSC will be affected, we need come out in droves to show the Pallister Government how we feel about these cuts and the total disrespect for Health Care Support Workers Professionals (we are professional in what we do). The Nurses were guaranteed that “there is a job for every nurse”. We demand fair treatment. Pallister guaranteed “No Cuts to front line workers”. Let’s tell Pallister that WE are FRONT LINE WORKERS! He broke his promise by cutting our jobs. Please share this with others who may not have received this information. If you know someone who believes that they have submitted their email address to us and they are not receiving these emails, please have them look into their “spam” or “junk” boxes. If the email is not there, please email cupe1550@gmail.com and type in the body of the email their name and their preferred not work email. Some handwritten emails have been discarded as we could not read the writing on them. So that in this time of constant news releases and updates, HSC CUPE Members please rest assured that until Local 204 has all of their communication pieces intact and has been given time to get the new website going, CancerCare Manitoba CUPE Members will ensure that their comrades at HSC continue to receive all of their information in a timely manner. We will continue to post all information necessary for HSC CUPE Members as well as use our email systems to get as much information out to you all in as timely a manner as possible. We are all in this fight together! Please see the notice below regarding the Employment Security notice for CUPE HSC Members. These are the changes brought about by the unreasonable cuts being imposed by the Pallister PC government. CUPE Local 1550 – CancerCare Manitoba has a new Executive! This Executive will not take effect until approximately October 1st. All were nominated and elected by acclimation. We do still need a one year and three year Trustee. Thank-you and congratulations to all of you who have allowed yourselves to be nominated and elected! The formatting needs to be fixed, but as these are draft for reading purposes only. Please bring any comments to the meeting or call our Local office at 204-987-2873. Please be sure to tell Patricia (our Admin Assistant) that you are a CCMB Member! Please note the time of the meeting, 5:00 pm. As we do not have anything in place at this time to hold meetings electronically, we need to allow time for our whole Membership to get to our McDermot site especially as the items on the agenda are very important. As CCMB grows and we accept 13 new members from the Community Cancer Clinics and Hub we will have to get used to allowing for travel time for the approximately 75 members who will be assigned away from MCC. We do have limited parking for those members coming in from St. Boniface and Screening Programs. Great for car-pooling! Please see the bulletins below. There is one for the HSC Members Local 204 as well as a general bargaining (or non-bargaining) update for everyone. Local 204 will be doing their by-law voting a little different than the norm as all of the locals have yet to come together into one general meeting. At this time it was thought that it was better and more effective to post the by-laws online for the members to view and to email in comments rather than to try and bring all 7000 members together. You will be able to vote on them at the end of August. A notice will go out later this week with that date and time. CCMB will be holding a special meeting at the end of August to vote on the by-laws in the traditional manner. We will meet, go over the by-laws, make any changes within the room and then vote on them. When we hold this meeting, there will be several other items on that agenda so keep watch for this. Come join us as CUPE Members from Health Sciences Centre and CancerCare Manitoba come out to protest the Pallister Government and all of their cuts. In just a few months we have seen a wide swath of cuts throughout all of healthcare in Manitoba. Pallister promised more long-term care beds – he put a freeze on those. This causes a back-log in our emergency rooms as they help care for this population. This also puts a squeeze on our medicine beds as they are used more often for long term care. Pallister will close down the Emergencies at Seven Oaks and Victoria General in order to open up Urgent Cares, he is completely closing the Urgent Care at Misericordia and the Emergency at Concordia. People living near both of these hospitals will not have any kind of urgent or emergent care in their neighbourhoods. What will that do to HSC and CancerCare? It will put more demands on our services. Many cancer patients go to the Concordia cancer unit and their Emergency. They will now have to start attending the Emergency department at HSC as well as the urgent care clinic at CCMB. This will put an extra burden on these resources as well as cause prolonged wait for care for people who are already very ill. If shovels are not already in the ground – no new building! – Pallister already put a stop to the new CancerCare building. Lunch and rest areas have been taken away to make office space, a library changed into a new department, there are workers hiding out in “closet” spaces in HSC, SMD and elsewhere. – At HSC as more people come through the doors of an already cramped space in emergency you have to wonder where will they all fit? As they close down operating rooms throughout the WRHA to have them come to HSC -where will they be put. This is a solid building. The walls are not elastic and cannot stretch to accommodate the expected increase in patient flows. – All of this while vacancy management is in place and we are all working short staffed and carrying heavier burdens than ever. Come join us to protest these cuts to our health services. Not only are we as healthcare workers affect but so are our patients! Place Patients First – and stop the cuts. Enough is Enough! You voted resoundingly YES to separate from Local 1550 and merge into Local 204 woth the other 21 WRHA CUPE Locals! There were 40 people in attendance at the meeting who were eligible to vote and the vote was 36 YES, 3 NO and 1 spoiled ballot. Over time the HSC Members will start to receive information regarding the organization of their new Local and CCMB Members will be receiving information as to how to reform Local 1550. Until the actual physical split between the 2 bargaining units, the Local will operate as status quo. Our Members will not notice any difference on the shop floor. Please see the letter below regarding the move to merging all 21 CUPE Locals within the WRHA into one large local. This moves comes as the Pallister Government is soon to enact Bill 29, which talks to merging the WRHA as one employer, working with fewer Bargaining Units and Collective Agreements. All HSC Members will soon be seeing postings telling them to come out and vote on this measure. Those postings will list the date, time and place of the vote. PLEASE NOTE: This is not a vote to change unions but to merge with other CUPE Locals. This will NOT stop your CUPE Membership. CCMB Members, you will not be eligible to vote (UNLESS you also work at HSC). CCMB, being a province wide employer group is separate from the WRHA. With this planned merger, HSC and CCMB will separate from each other. CancerCare Manitoba Members will continue to be Local 1550 while the HSC Members will join the Members of the other 20 CUPE Locals within the WRHA. We will be holding info tables and sessions over the next two (2) weeks to answer questions. These tables will be held throughout HSC and at various times in order to reach out to all shifts including those on the weekends. We will also be holding noon hour meetings at CCMB at all 3 sites to discuss facing this Bargaining Unit. If you have any questions or concerns, please contact the Local office. Total votes cast: 478; 1 ballet was spoiled for a total of 477 counted out of 2954 members for a 16.15% turnout. We have been asked a number of times what the vote count was. This local has a practice of not releasing that information as that often causes more divisiveness rather than helping to heal any riffs that may have happened during the election. Jamie Johnston has been elected as Vice-President. Congratulations to both candidates for a well run campaign! 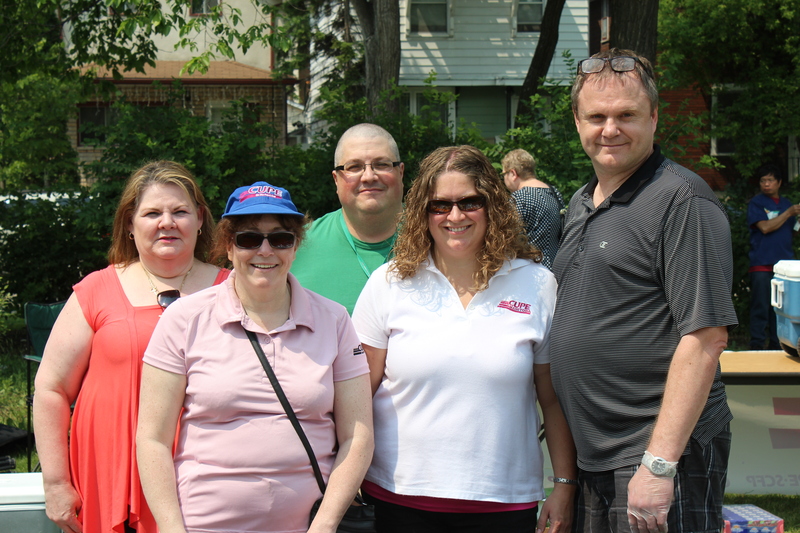 On Tuesday, April 30th, CUPE Manitoba worked with CUPE Local 1550 to host a BBQ in the community for the Members of our Local. It was a beautiful day for a bbq. We gave away over 1000 hotdogs, chips and juice boxes that day. When we chose this day for the bbq little did we know that we would be able to have the help of our National President Paul Moist. He just happened to be in Winnipeg at this time so he volunteered his time (and muscle) to help move tables and equipment as we set up for the event. 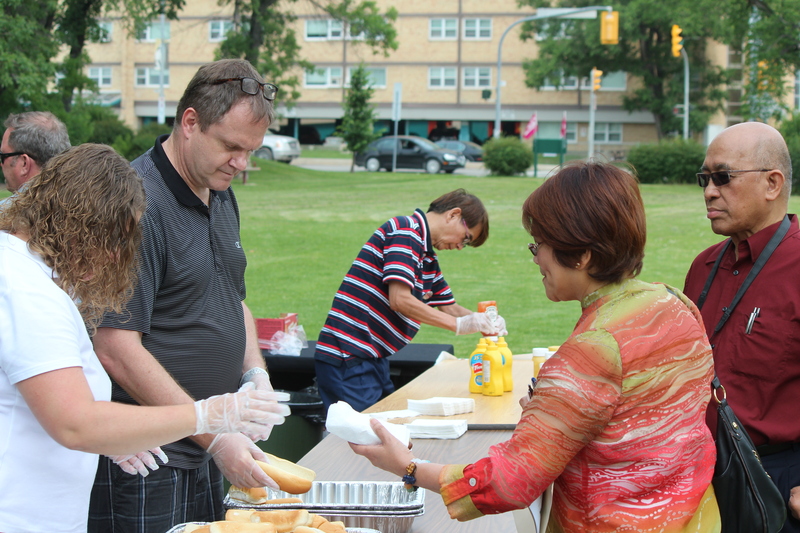 He also stayed to greet our Members and serve them a hotdog. 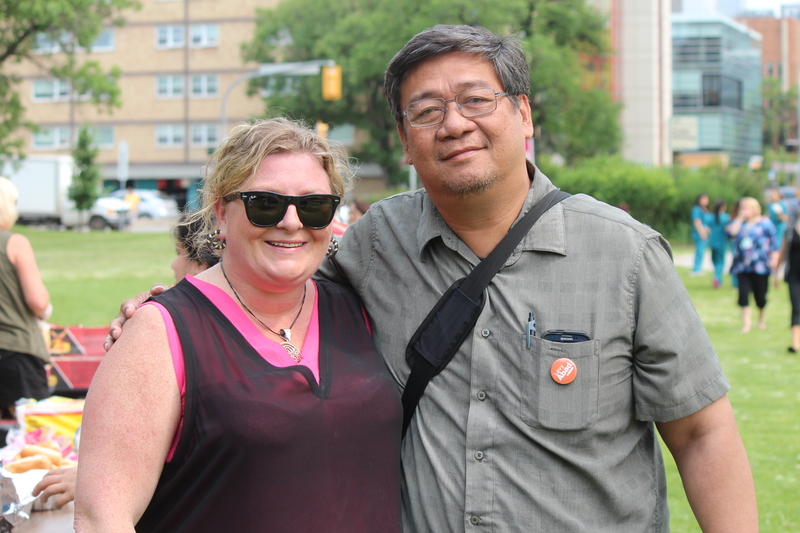 Kelly Moist, the President of CUPE Manitoba worked together with our Table Officers to plan this event so that this truly was a co-hosted event of CUPE Manitoba and Local 1550. Margaret even had the company Jenna the Administrative Assistant for CUPE Manitoba to go on the “off site” tour. We delivered lunch to the CancerCare Members who work at our units at St. Boniface Hospital as well as the breast/cervical/colon screening programs across the street from Misericordia Hospital. Jodi made the trip to the HSC offsite group at Wellington so that they could also enjoy some lunch. Unfortunately our National Representative Shannon McAteer was away on vacation. So, for the day we received the help from two National Reps! Alex McClurg and David Jacks were on hand all day providing help where needed. We also had the enthusiastic hotdog serving help in the person of Marion Moist. She was able to fill in while Jodi and Margaret were out travelling to the offsite groups. 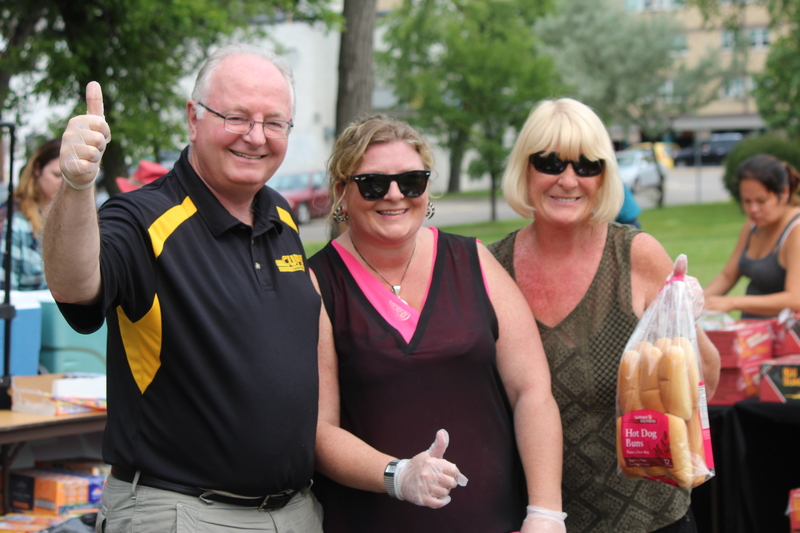 We even had help from a Member from CUPE Local 500, WRHA group serve up lunch. Mylin jumped right in and helped out until our travelling Table Officers were back at the tables and ready to serve. 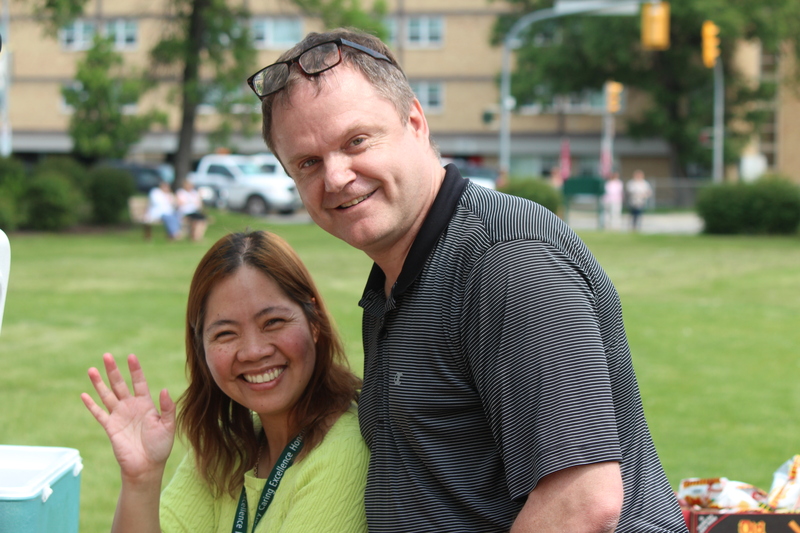 Local 1550 President with Mylin, a hardworking volunteer from the CUPE Local 500, WRHA group. One of the busiest people of the day was Butch, one of our Housekeepers. His diligence in breaking down boxes, collecting garbage and wiping tables was an enormous help. With his help we were able to keep to our timeline with the City of Winnipeg to have our garbage ready for pick up at 1:30. Butch our very busy volunteer. Cleans while working as a Housekeeper with a CCMB assignment and volunteers to clean up for the Local! Behind the scenes the Local’s Administrative Assistant Patricia worked as hard as everyone else. She moved tables, hauled things up and down the stairs, sliced onions and managed to keep control of our office. Of course, our Table Officers were busy throughout this adventure from planning, set up and serving. We even had the opportunity to visit with Levy Abad the Filipino music, songwriter and activist as well as with the Hon. Flor Marcelino the Minister of Multiculturalism and Literacy, The MLA for the Logan Constituency. We have new Collective Agreements for both of our Bargaining Units. Unfortunately, DSM will now be transitioned over to Local 4214 with the rest of Diagnostic Services of Manitoba Inc.
Our Local’s bargaining units are now made up of the Support Workers from Health Sciences Centre and CancerCare Manitoba. The new updates are now uploaded. Please follow the link below.